Sucralose, Natural and Artificial Flavors, Medium Chain Triglycerides, and Sunflower Lecithin. 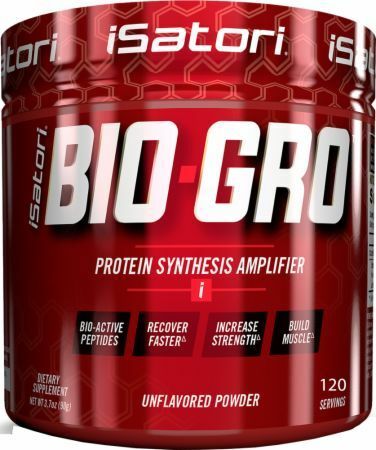 As a dietary supplement, adults mix 1 serving of Bio-Gro™ twice daily in 3-4 oz of liquid (such as amino acid, pre-workout drink, or protein shake) and thoroughly agitate or blend, or mix in soft food (yogurt, oatmeal, etc). Follow daily useage chart for optimal results and ensure one serving is taken before, during or after your workout. BIO-GRO is available as an unflavored or flavored powder that can be taken anytime with or without food. KEEP OUT OF REACH OF CHILDREN. Do not use this product if you are pregnant, nursing, or contemplating pregnancy. If you, or your doctor, have any questions about this product, please call 1-866-688-7679. Not intended for individuals under the age of 18, unless instructed by a doctor. Consult a physician or healthcare provider before using this or any other dietary supplement or starting exercise program. WARNING for California residents only: This product contains substrates known to the State of California to cause cancer and birth defects and other reproductive harm. Exposure to moisture and humidity may cause clumping but will not affect product efficacy. Do not use if packaging has been tampered with. STORE IN A COOL, DRY PLACE. AVOID EXCESSIVE HEAT. ALLERGEN WARNING: Contains Milk Product (Colostrum). As a dietary supplement, mix one scoop of Bio-Gro twice daily in liquid and thoroughly agitate or blend (clumping likely if stirred in plain water), or mix in soft food (yogurt, oatmeal, etc.). Bio-Gro is an unflavored powder that can be taken anytime with or without food. KEEP OUT OF REACH OF CHILDREN. Do not use this product if you are pregnant, nursing, or contemplating pregnancy. Not intended for individuals under the age of 18, unless instructed by a doctor. Consult a physician or healthcare provider before using this or any other dietary supplement or starting any exercise program. Exposure to moisture and humidity may cause clumping but will not affect product efficacy. As a dietary supplement, mix 2 to 3 servings (heaping scoops) of Bio-Gro twice daily in 6 to 9 oz of cold liquid or mix in soft food (yogurt, oatmeal, etc.). Bio-Gro is available as an unflavored or flavored powder that can be taken anytime with or without food. KEEP OUT OF REACH OF CHILDREN. Do not use this product if you are pregnant, nursing, or contemplating pregnancy. Not intended for individuals under the age of 18, unless instructed by a doctor. Consult a physician or healthcare provider before using this or any other dietary supplement or starting any exercise program. Exposure to moisture and humidity may cause clumping but will not affect product efficacy. Do not use if packaging has been tampered with. As a dietary supplement, take 5-7 capsules with a glass of water. Bio-Gro capsules can be taken anytime with or without food or with aminio , pre-workout, or protein shakes. Follow daily usage chart (on side panel) for optimal results. May 31, 2016 Bio-Gro Review – This Time, With BLOOD TESTS! It's finally out, and boy has the hype been strong. Let's break things down here. So iSatori is taking another leap with another company Europa Sports. Dubbed as the "Game Changer", iSatori started "pre-promoting" their new product, Bio-Gro. At the 2013 Arnold Sports Festival Supplement Expo they had a huge image teasing people about their biggest breakthrough "since creatine". This is a muscle-builder product. It's gender-neutral - both men and women can use it. The more you take, the better it performs. It can be taken any time of the day - pre workout, during, post workout... whenever. Just get it in. Sounds like creatine in that aspect. It is being marketed as "Bioactive Peptides" -- "Fertilizer for your Muscles"
It is unflavored. Perhaps to be used as a "protein booster" or "pre workout booster" that you mix with anything! Want to know more? Sign up below and we'll hook you up with the intel when it's released! As of April 2013, iSatori is getting more and more aggressive in promoting this, which excites us as we watch from the bleachers. They are too smart to throw out a flop. So this is either going to be an epic supplement, or an epic controversy with some dramatic fireworks. Either way, we have the popcorn nearby, and would love a stab at beta testing it too! We had the honor of reviewing Bio-Gro. We didn't get into the science, but explained our results below. In short, this seems to be worth it as a second-tier supplement. Got a big competition coming up and some extra cash? Go for it. On a strict budget? Then you'll probably want to pass. If you're under 200 pounds, it's 2 scoops in the AM, and 1 scoop in the PM. This means that with a total of 60 scoops inside, in each tub, you're either getting a 20 day supply or a 15 day supply. So, in general... if you want a month's supply of this, go ahead and double your order, and double the price you see listed above. The Biggest Thing Since Creatine?! Just to note, Creatine has been the safest and most effective supplement ingredient to date. It has minimal side effects with great benefits and it is even dose dependent. The larger the dosage and the longer you take it, you get great results. The claims of iSatori that their product is the biggest thing since Creatine might seem far-fetched for most bodybuilders out there, but we're confident. iSatori might have problems with their promotions though. The words "game changer" have been used by many supplement companies in their quest to creating the best supplement. We've heard this before, so we'll keep tempered enthusiasm. One such company touted their supplement to be the next best thing to BCAA only to leave a lot of users disappointed (silk amino acids, anyone?). Still, iSatori has a lot to gamble with their new supplement. However, the presence of supplement distributing giant Europa Sports gives bodybuilders some hope that there may be something in the Muscle System worth seeing. Europa is the largest distributor, and they don't mess around. It sounds like this will only be available through them. To put it simply, Europa doesn't mess around. They are traditionally cautious in their promotions, and we don't see them stamping a dud with a full-on distribution partnership. It's a wait-and-see game as the website doesn't give anything away other than the supplement name and claim with a sign up box to alert you of future updates. If you can't wait for the release date of the Muscle System, iSatori may have the supplement that you need. The products come with a hefty price tag but a relatively low number of negative comments speak of its quality. In fact, a lot of the negative comments have to do with the price rather than an ineffective product. A concoction of growth factors backed with clinical trials and results. ISA-Test contains Somatrin(TM), Testofen(TM) and several other ingredients that work to give you immense muscular growth. The combination of ingredients boost testosterone while several of them reduce estrogen. A combination of several Creatine preparations. This has been immensely popular with bodybuilders. The different Creatine preparations have different absorption times which mean you get a longer dose of Creatine. A power pre workout supplement. Its ingredient profile is powerful enough that one scoop is all you need. It contains a powerful mix of ingredients like Beta Alanine, Creatine, Caffeine, AKG and more. High quality ingredients like these would mean a higher price tag though. The fat burner of iSatori. It's an incredible mix of fat burners. Again, it has a hefty price tag but it does work. Many reviews state that the product works without exercise but the fat burned or weight loss would typically be 10 pounds one bottle. Combined with intense exercise and a couple of supplements like a PWO and a good diet plan, it's a winner. During workout, lactic acid builds up in muscles causing fatigue. Acidosis also means that there's an abundant amount of hydrogen ions (H+). Using this concept, iSatori makes a unique supplement that targets the production of Hydrogen ions allowing you to recover faster. It's a one of a kind product geared for power lifters. You can wait for the Muscle System of iSatori or you can have a head start with some of their best supplements. It might be better to keep on working out rather than waiting for a near to mythical supplement, irregardless of all the hype it's generating. Hey, if it does come out, you already have a toned body that can benefit more when iSatori finally delivers its promise. The iSatori Muscle System - Coming April 16, 2013!